Gold has represented beauty since ancient times, when it was used on the skin to make it shine on its own. Over the centuries, gold has been used both for wellness and for luxury make-up. Researches have revealed that Cleopatra did sleep with a golden facial mask to preserve and increase her sparkling beauty. 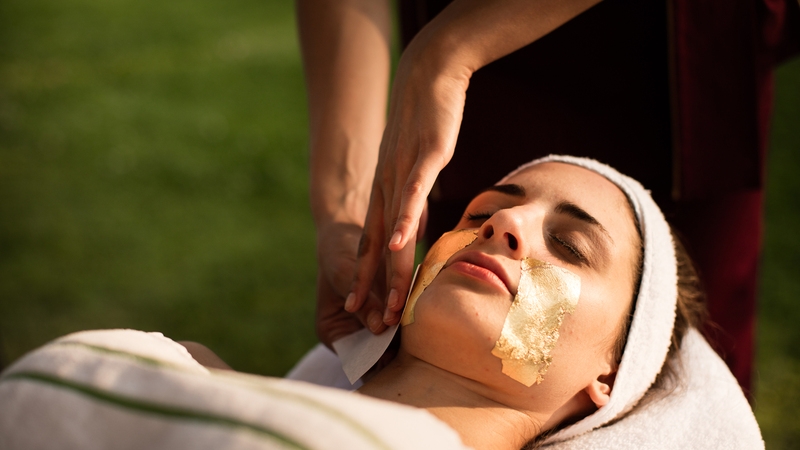 This kind of beauty treatment can be executed only in SPAs, since professional massages are requested both before and after the application of the gold leaves to the skin. This innovative treatment is the first in Italy to use 24-carat (999,9°/00) gold leaves - a special handmade edition for The Merchant of Venice SPA. The treatment uses eleven 24-carat gold leaves combined with two serums, one pre- and the other post-application. Gold can be used in cosmetics to decorate the body: the noble substance exalts the beauty of fingernails, lips and eyelids, drawing out their natural elegance.